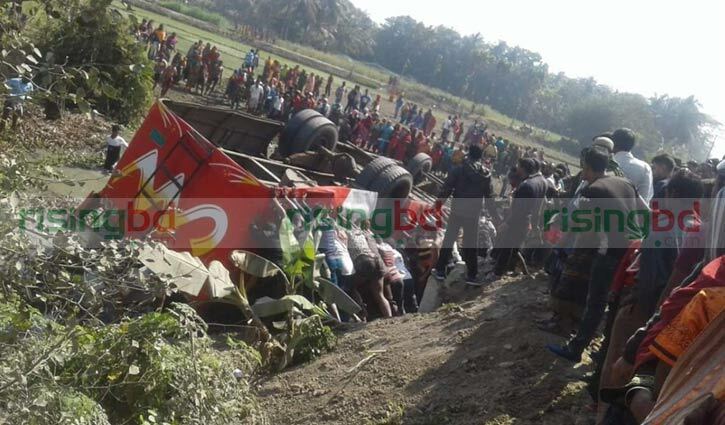 Staff Correspondent, Khulna: A schoolgirl was killed and 30 others suffered injuries when as a picnic bus overturned in Dumuria upazila of the district on Monday. The deceased was identified as Meghla, a class-VIII student of Shyamnagar Secondary Girl High School in Sadar upazila of Jashore. Aminul Islam Biplab, Officer in Charge (OC) of Dumuria Police Station said, three picnic buses were heading towards Shat Gambuj Mosque in Bagerhat this morning. But, a bus turned turtle in the area around 11:30am, leaving the school girl dead on the spot and injured 30 others. The injured were taken to Upazila Health Complex and later critically injured have been shifted to Khulna Medical College Hospital. Fire service and police forces are jointly working to recover the bus.